This little guy can turn a little catnap into an all day snoozer. 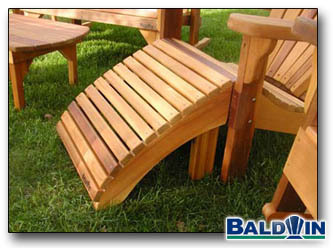 It is built to accompany the Baldwin Chairs and Classic Lawn Chairs. My favorite set is the Baldwin Rocker used with an Ottoman turned backward. Your feet are elevated and you have something to push against.